Genesis RoboCop versus The Terminator (USA) in 14:06.92 by Cardboard. RoboCop versus The Terminator (1993) is based on a comic book that is a typical example of two popular but completely unrelated fiction universes merged into one. Such a process usually results in ruined timeline coherence for either, and this game is no exception. As a result, we get a pretty wild mishmash of RoboCop's and Terminator's backstories in a silly plot accompanied by equally silly gameplay. This includes seemingly inescapable bullet sprays, leotard-clad baddies, exploding heads, hidden 1-ups conveniently placed in molten lava, and so on. The sheer frustration RoboCop experiences from all this madness can only be vented by banging his head on a rock! 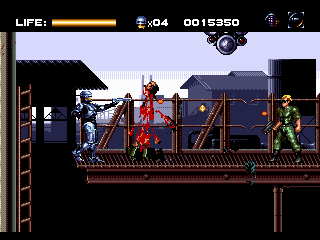 The Genesis version of this game is notable for the amount of gore and other PG-13 goodies, as well as for the ability to abuse death and other things that make it most suitable for a TAS.